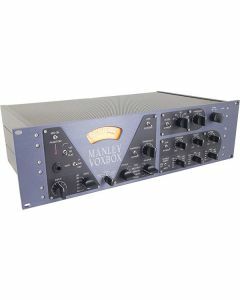 The VOXBOX combines the legendary Manley Mono Mic Preamp, the ELOP reborn as a lower ratio compressor, the MID EQ blown out as a full range PEAK-DIP-PEAK EQ, and a DeEsser with a second ELOP limiter at the end. Using the Direct Input, bass players often wonder why it wasn’t named the BASSBOX. Primarily, it is a voice processor which in itself is not a novel idea, but the time had come to pull out all the stops and make a truly professional high-end statement. One that covered the needs of the project songwriters and big-time major studios alike. One whose all-tube signal path could bring every instrument and overdub to life. One that, plain and simple, sounded unquestionably better than the rest, provided flexibility, simplicity, and well thought-out ergonomics. Full of features, timeless style, robust build quality, and that world-famous "Manley Sound", presenting the MANLEY VOXBOX. That's nice, what's it good for? The preamplifier is a clone of a highly regarded and popular mic pre: the Manley Mono Microphone Preamplifier! The mic input transformer is Manley's own design wound in-house at the Manley Labs factory. High current 48V Phantom power is switchable from the front panel. A simple and effective passive BASS CUT switch kills rumble and reduces popping. The INPUT ATTENUATOR is a variable pad control situated before the first tube stage allowing the preamplifier to accommodate +4 line level signals via the balanced LINE INPUT and instruments via the front panel 1/4" DIRECT INPUT. These inputs are selected in the middle position of the dual-function phase invert switch. Manley provide both transformer balanced XLR output as well as a transformerless "audiophile" 1/4" phone jack output. The Gain switch is actually a clever variable feedback control that changes not only the gain but the slew rate and flavor of the circuit. With it you can choose how laid back and mellow or how up-front and aggressive you want it to get. Headroom is a strong point in this circuit, +31dBu capable. This is 5 to 10 dB better than almost all other pro gear. The music passes through only our super-clean pure Class A vacuum tube circuitry. There are obvious advantages to our purist approach and foremost is the un-electronic final sound that carries emotion into the digital realm. Lots of folks requested that they include the Pultec Mid Frequency Equalizer in the VOXBOX, but they wanted MORE.... Now Manley have extended it to 33 frequencies in 3 bands with 6 new frequencies from 20 Hz to 150 Hz, and 6 more in the highs from 6.4 KHz to 20 KHz. Ever notice that only EQs with real inductors have the bottom end magic or that only Class A circuitry can keep the top end sweet? This is for you. The EQ INPUT switch patches in the Line Input, Preamp Output, or the INSERT return. This switch serves double-duty acting as a bypass switch for the preamp and/or external processors or for processing two different tracks. The METER is a full size illuminated Sifam VU meter. A five-position switch shows three audio levels: the line input, the preamp output and the final output. It also shows compressor gain reduction and the de-esser/limiter action. Other clever innovations incorporated into the VOXBOX combo include warm-up muting circuitry, extensive magnetic field containment, 'smart -grounding', and silent switching. The sum-total is more than the separate parts: consider the reduced patching, the short path to tape and you having this much immediate control. As engineers, they choose what they use not based entirely on features and functions - there is a sound, a texture Manley reach for and the VOXBOX combo puts the 'Manley Sound' together with 'Your Sound'.